The village of Bodham can be found between Holt and Cromer and, with many farmhouses, it is obvious that the main industry was agriculture. Today farming still plays a prominent part but people also travel out of the village to work. Up until 1926 Bodham had a flourishing foundry which made agricultural equipment for the area. When the foundry closed the building was turned into a blacksmith's that produced tools for both farming and domestic use. Today the building has been converted into private dwellings. Bodham and its surrounding land was once owned by the Mott and later Mott-Radclyffe family. The family's monogram can still be seen on some of the houses and estate cottages. In 1986 the Bodham and Beckham village hall was opened, which replaced the old Jubilee Hall. It is a very popular place hosting many events throughout the year. 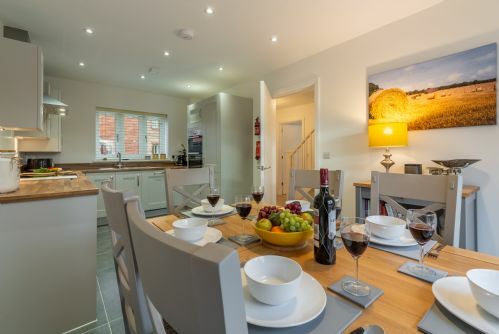 This modern detahed property quietly located in a cul-de-sac, is in a great location, close to Sheringham and Cromer and the Deep History coast and in easy reach everything North Norfolk has to offer including stunning beaches, fabulous eateries and an abundance of wildlife. .